Seasonal produce comes with nutrients and properties that the body needs to battle the change in season and to withstand the adverse effects of the weather. All summer vegetables and fruits are usually high in water content to supply the extra dose of water needed by the body. Similarly, during winters, it is important to include foods that would heat up the body from within and help in burning calories. 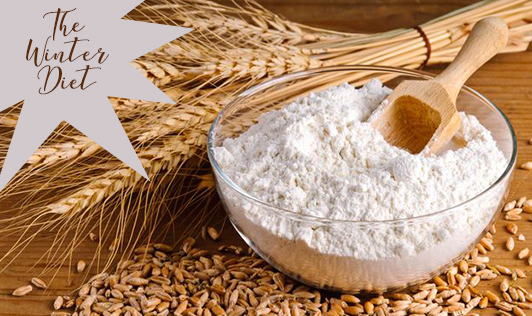 Millets and grains can easily be incorporated in the diet in the form of flours which are easily available in the market and fuss-free to use. Flours like maize, jowar and bajra are not only healthy and gluten-free alternatives to the wheat variants but can be used to create some sumptuous dishes. It is said that jowar is a powerhouse of nutrients with a high source of calcium, vitamin B and dietary fiber. It also contains essential minerals like iron and phosphorous, and is loaded with antioxidants that work towards keeping cancer and other diseases at bay. Jowar flour can be used to make rotis or mixed with other flours to make paranthas, khakras, pooris, even cookies and bread. Besides these, jowar flour can be used to make banana cake, tacos with spicy fillings or apple crumble. Corn is a rich source of vitamin A, B, E and essential minerals. It is high in fiber content, which plays a significant role in the prevention of digestive aliments and thus is perfect for those following a gluten free diet. Different forms of corn like fresh corn used for salad, soup, maize flour used in baking cookies and breadsticks, frozen corn used with herbs and masala to make chat, etc. Being rich in fibre and protein it can be used to manage diabetes and cholesterol levels. Though Bajra roti and khichdi are the more popular items prepared, bajra crepes, tarts and wraps are some of the other treats that can be made as well. Loaded with fibre, protein and antioxidants, foxtail millet helps in keeping heart disease, diabetes at bay. It can be used to make porridge, kheer, or added to idli and dosa batter or even eaten as a substitute for rice.